I am a researcher and an academic staff at Dept. of Electrical Engineering and Information Technology (Departemen Teknik Elektro dan Teknologi Informasi (DTETI)), Fakultas Teknik, Universitas Gadjah Mada (UGM), Indonesia. I received B. Eng. degree from DTETI, UGM, Indonesia, M. Eng. and Dr. Eng. degrees from Department of Computer Science and Engineering, Toyohashi University of Technology (TUT), Japan. I am interested in Robotics, Intelligent Vehicles, Embedded Systems, Computer Vision, an Parallel Computing. Researcher of Active Intelligent and System Laboratory (AISL) Toyohashi Gikadai, using commercial service robot ENON, collaboration with FUJITSU Ltd., supported by NEDO (New Energy and Industrial Technology Development Organization, Japan) 2011. Researcher of Service Robot for Medical, supported by Fukushima Medical University (FMU), 2013. Researcher of Simulator Development for Nursing Home Facilities, 2014. 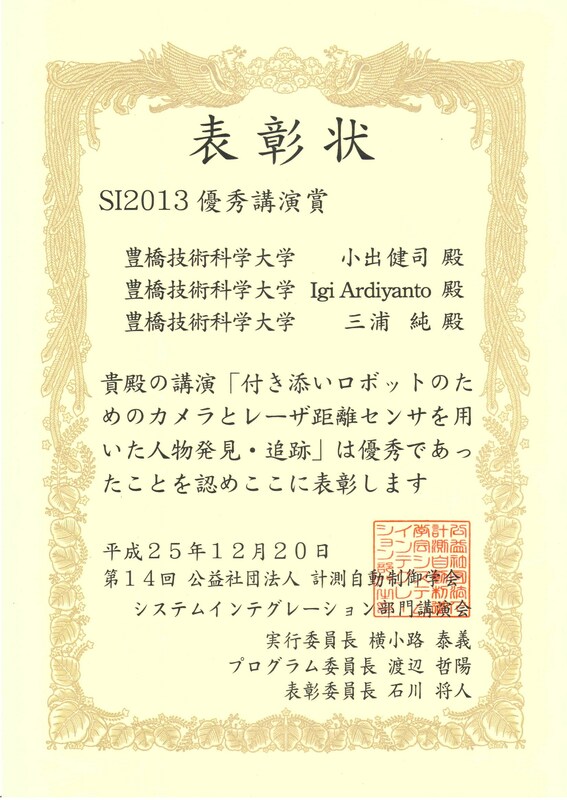 Principal researcher of Simulator Development for Human Action Recognition, 2014-2015. 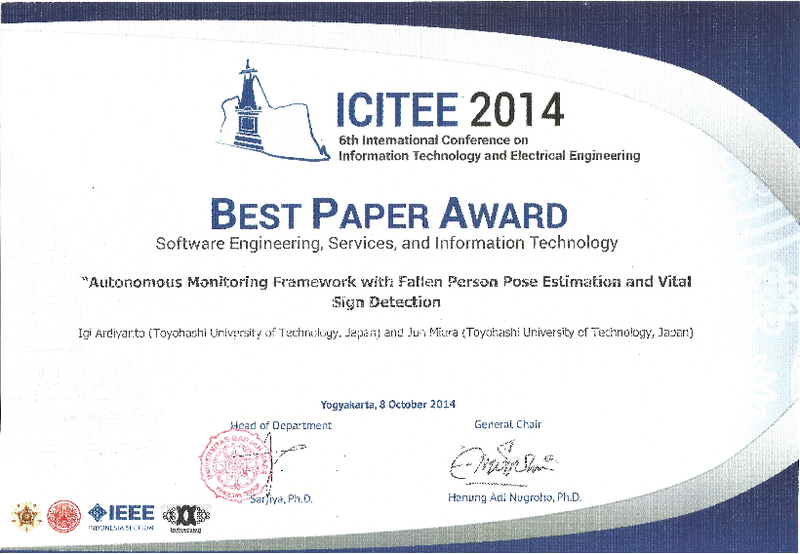 Best Service Robotics Paper Award – Finalist on the IEEE International Conference on Robotics and Automation (ICRA) 2013. 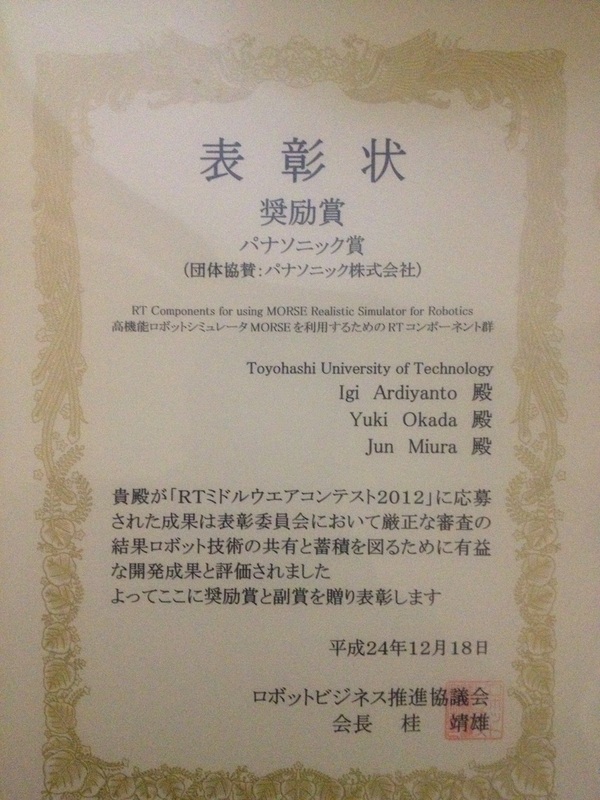 Panasonic Award (パナソニック賞) 2012, for “RT Components for using MORSE Realistic Simulator for Robotics”, from the perspective of universal design, easy to use, works in safety and security, specifically for energy and resource saving, and lead to excellent for eco-friendly and environment. Powered By by Inkhive Themes. © 2019 Dr. Igi Ardiyanto. All Rights Reserved.